Happy Friday Eve! Hope your week is going well. As I was sorting through all the goodies I brought back from CHA, I found a few quirky and fun photos I thought I'd share today. The Darice booth was big...and *popping* with celebrities! Now, these pics were taken with an iPhone and from a bit of a distance, so forgive the graininess. 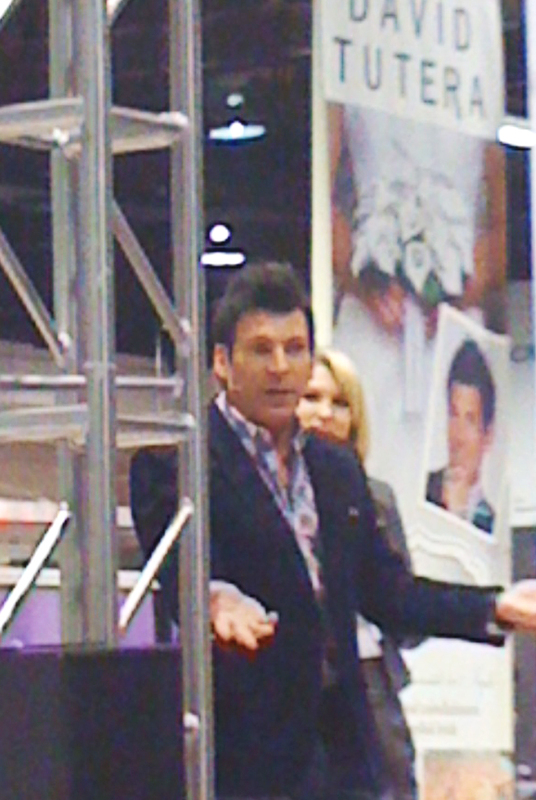 Here's David Tutera of My Fair Wedding. My mom is a fan and she snapped this one. 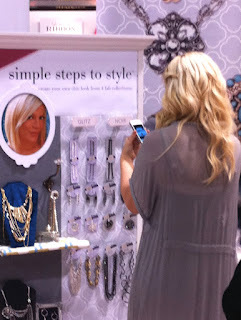 At the close of the show one evening we spied little Ms. Tori Spelling, after showcasing her new jewelry line. She'd finished with her speaking engagement, had wrapped up signing autographs, so we were only able to grab a photo or two as she was about to leave. She'd taken out her phone and was snapping pics of her own display. Again, Mamarazzi captured the one above. 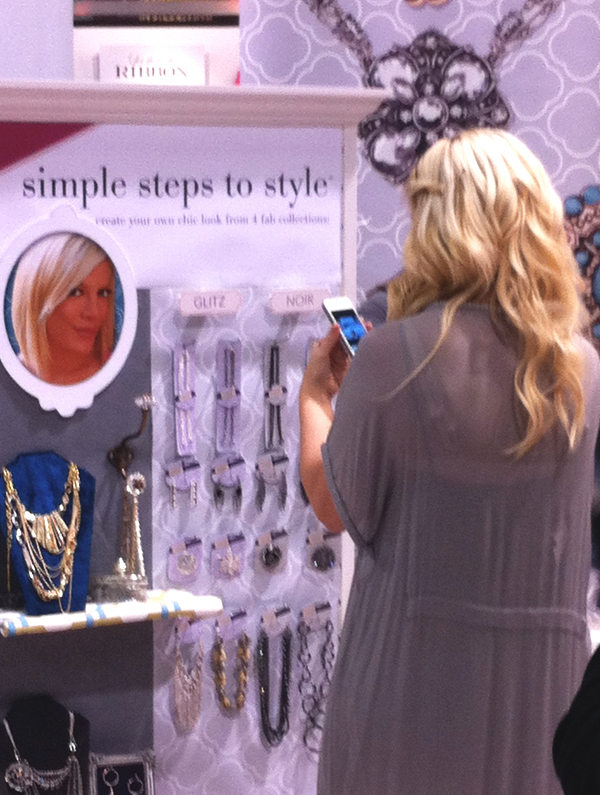 And I snapped this one of Tori taking a photo of her own image from her display! Looks like she's looking at herself in the mirror, huh? Crazy! 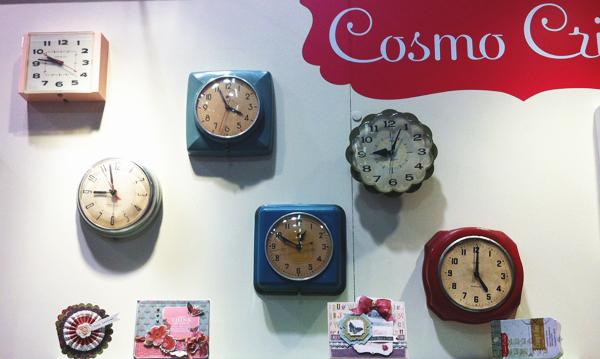 OK, this one is out of left field, but I just loved these old kitchen clocks on display in the Cosmo Cricket booth. Did you have one of these hanging in your kitchen when you were growing up? Check out the cool shaped booklet of tags on the right, just below the bottom row of clocks. That's another of those snazzy new Element Decks...yum! OHHH! I wish I was there! Maybe next time! LOVE the pics (even if they were from an iPhone!!!). Oh I love the wall of clocks! I didn't see that! !